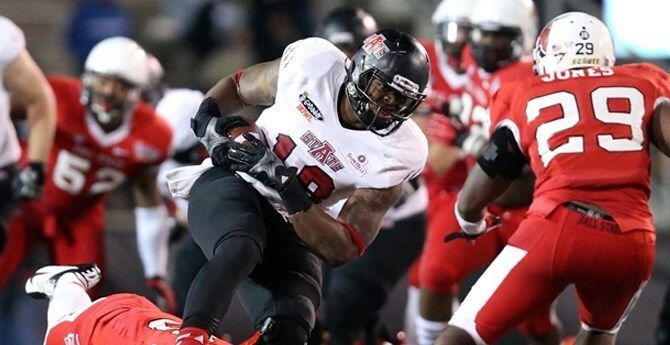 Arkansas State's Darion Griswold arrived at the school as a quarterback; he's now a tight end, and a very good one. He also arrived in Jonesboro as a two-sport athlete; now he plays only football. Griswold, a 6-foot-5, 264-pound fifth-year senior, has gone from a student-athlete with the potential to make an impact in the Red Wolves' offense to one who has a great chance to be playing football on Sundays a year from now. If anyone in the Sun Belt Conference knows anything about making tough decisions and fashioning his skill set to new circumstances, it's Darion Griswold. The Dumas, Ark., native was set to play quarterback at Arkansas State. Soon after joining the team, he was asked to move to tight end. The move has been successful as he ranks high on the school's all-time receptions list for a tight end and has gained the attention of NFL scouts. The past two season he has been named to the John Mackey Award watch list. The award is presented to the nation's top tight end. Griswold was also an all-state and all-conference basketball player in high school and his first season at A-State – his redshirt year with the Red Wolves – he also played basketball at the school, and was a solid contributor. But after one season, he decided being a one-sport athlete was the best route, and thus he gave up basketball to concentrate his efforts and conditioning to football only. It was not an easy or simple decision. "It was tough,'' he said of that first year. "My freshman year I played football and transitioned into basketball. You have to be in a different kind of shape for basketball and you travel a lot. Basketball was fun. It was one of the first sports I ever played and I loved it and still love it to this day. It was an awesome experience to be able to play two sports. It was pretty cool. A lot of my football teammates actually came and watched me my first game. I didn't even score but I got a rebound and the crowd went crazy. That was pretty cool. "It was so different. The workouts were a lot different. In high school, it was just about all the same. You played just about the whole game. But in college it was different. I ran up and down the court a couple of times and I was gassed. Being in basketball shape (at this level) is a totally different monster." Even though his comfort level increased and he willed himself into basketball shape, Griswold still felt the best decision for him was to pick one sport, and in this case, football won out. "It was very difficult. I didn't really want to let it go,'' he said. "I think I made the right decision, although it was a tough decision – one of the toughest decisions I've had to make," he said. He stuck with football, but not at the position he expected to play. Quarterback was the position at which he felt he would make his mark, but members of the A-State coaching staff at that time – he has played for four different head coaches (Hugh Freeze in 2011, Gus Malzahn in 2012, Bryan Harsin in 2013 and Blake Anderson in 2014-15) – decided he was better suited as a tight end. Indeed, he has handled the switch well. In the past three seasons he has caught 52 passes for 705 yards and seven touchdowns. Last season, he hauled in 18 catches for 221 yards and four scores. "You have to do a lot of different things as a tight end,'' he said, these days clearly happy with being a tight end. "You have to be a wideout and learn how to play as a wideout. You have to learn how to block and even go in the backfield and play some as a fullback, too. They throw a lot of different things at you. While clearly identified and invested as a tight end, Griswold admits there are still moments from time to time when he keeps a close eye on those playing his former position. There are even some moments when he wonders how his career would have turned out had he not been asked to change positions. Blake Anderson has only known Griswold as a tight end, and he said he is excited to have him at that position. 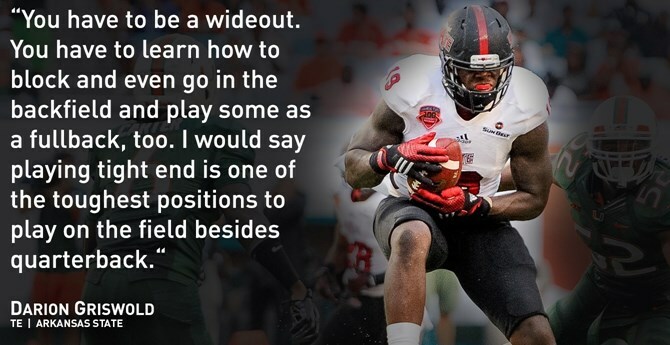 In the offense the Red Wolves will run this season the tight end can play an important role. "That's a feature position for our style of offense and always has been,'' Anderson said. "You look at our history there are a lot of guys playing at the next level. We're always looking for a guy who is versatile and can play with his hands on the ground as well as he can standing up. "With his basketball background, we knew that he could do all that. He's got tremendous range in his length and his ball skills allow him to be exactly what we're looking for. He's done a good job with his body composition and his footwork over the time that we've been here. He's become a better player each and every day. Tickets for the Red Wolves’ football season are on sale at the A-State Ticket Office, located at the Convocation Center’s lower red entrance. The ticket office can be contacted at 870-972-2781 and ticket information is also available on the Ticket Central Page on AStateRedWolves.com.